We have extensive experience in meeting the requirements of Clean Agent Extinguisher that find application in protecting valued assets from fire. These portable fire extinguishers are user safe and can be used on class A, B, and C fires. Featuring presence of halogenated agents, these clean agent fire extinguishers are also non corrosive which makes them last long. 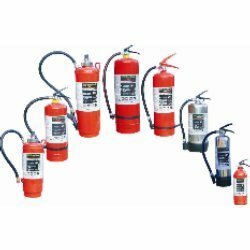 Some of the application areas of these fire extinguishers include Process Control Rooms, Medical Diagnostic Centers, Data Processing Centers, Telecommunications Facilities, Power Generating Equipment, Clean Rooms and others. We are presenting an impressive array of Fire Extinguishers offering clan agent FE36 that is a better replacement to HALON 1211. It widely used in class A, B, and C fires as well as electrical fires. These agents have zero ODP and are colorless, odorless, and non-residual and less toxic. We also offer our clients Dry Powder Fire Extinguisher, Foam Type Fire Extinguisher. These are in conformation to IS 15683 standard.